Padres social media day meant meeting tons of passionate and fun Padres fans. I also took the opportunity to talk to folks about hunks. That meant collecting votes and opinions regarding the best looking Padres of all time, as a follow up to a recent discussion about current Padre hunks. After getting past the awkwardness of explaining what I was doing, people submitted their choice for the biggest Padres hunk, which also led to some hot (pun not intended) and passionate (pun also not intended) debate. Some special celebrity voters were included as well. Does this thing get Pinterest? The rules were simple: any player on the Padres roster at any time in history was eligible. Opinions varied greatly, with a large number of names mentioned and justifications from preferring the brains of pitcher Chring Young to the squatting ability of Fred McGriff. We received a total of 25 votes, and after disqualifying the top vote recipient “Why Are You Doing This?” an ultimate all time Padres hunk was crowned: Ken Caminiti. Vote for your favorite hunk here! Who is the Padres all time hunk? PS – If you’re viewing this on a mobile device, you’ll have to view the desktop version to vote on the poll. Our engineers are working on a fix soon. Only 1 man has improved his score in the online poll. 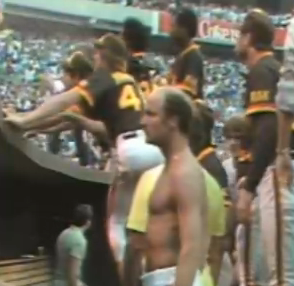 That’s right….Eddie Whitson w/shirt off against the Braves in ’84.